TrueOS. TrueOS is, in turn, based on FreeBSD’s development branch. TrueOS’ goal is to combine the stability and security of FreeBSD with a preinstalled GNOME, MATE, Xfce, LXDE or Openbox graphical user interface. review I wrote two years ago on Lumina being developed for Linux. 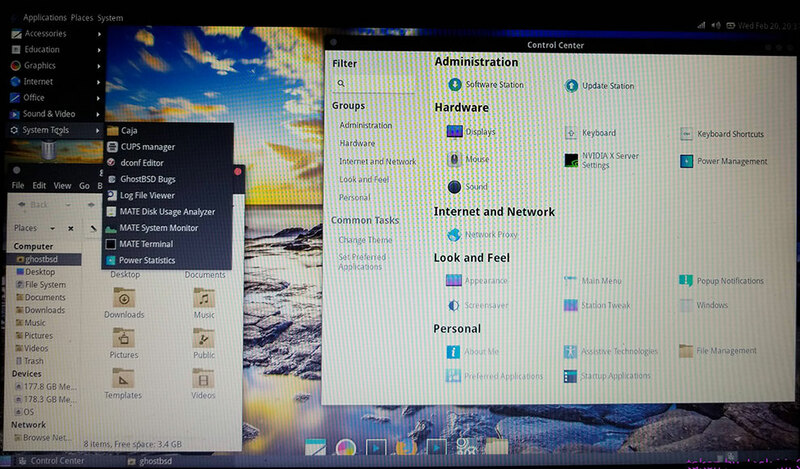 The Lumina desktop can be installed manually on a few compatible Linux distros. I wrote about that in my initial review of Lumina’s potential for Linux. However, the Lumina desktop in Linux is still not readily available without heavy-duty tinkering. Lumina is the default desktop for a few BSD projects, so my initial hope for this week was to review TrueOS, a BSD project running the Lumina Desktop natively. Ken Moore is the founder and lead developer of the Lumina desktop environment and a developer with the former PC-BSD project that became TrueOS. Alas, TrueOS has been discontinued as a standalone release with the Lumina desktop. Today, TrueOS is a platform for building other operating systems. Project Trident. Still wanting to take a closer look at the redesigned Lumina 2.0, I hoped to check it out via the Project Trident BSD release. That approach failed. I could not get Trident to install. It does not have a live session ISO and balked at installing on my test computer’s hard drive or in a virtual machine. GhostBSD for this week’s Picks and Pans review. Why GhostBSD? Its latest release is fairly current. The latest release is Version 1812 released on Dec. 31 of last year. When I started asking around community support boards about various BSD distributions, recommendations for it were quite positive. However, I could not delve into the Lumina desktop as originally planned with TrueOS and Project Trident. Previous releases of GhostBSD offered two desktop choices: MATE and Xfce. 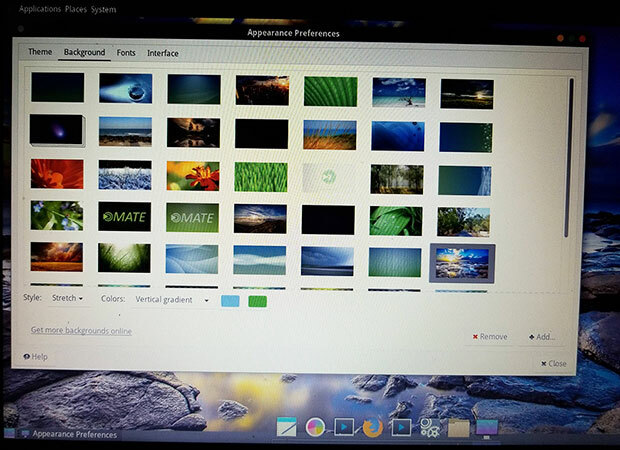 The latest release is only available with MATE, though, which is an extension of the old GNOME 2 desktop. Still, MATE is an interesting user interface to compare BSD to traditional Linux distros. GhostBSD’s MATE desktop offers the look and feel of any Linux distro running the same desktop environment. What once was called “BSD” no longer exists. Back in 1969, BSD was developed by a team at Bell Labs and become Unix. BSD was a closed source OS using the Assembly language. BSD underwent significant rewriting in the C programming language. Its derivatives are the direct descendants of Unix. The macOS, the operating system driving Apple machines, is also a closed source descendant of the BSD family. The original BSD operating system no longer exists. Its name lives on in reference to the existing family of BSD derivatives, which evolved into operating system families that were developed and supported by open source communities. They include FreeBSD, OpenBSD, NetBSD, DragonFly BSD and other distributions. FreeBSD, of which GhostBSD is a relative, targets typical users migrating to open source from Windows and Linux. FreeBSD accounts for about 80 percent of the BSD installations, according to some communities. The differences among these open source variants are small. So are the differences between Linux and BSD. Linux and BSD share numerous traits. The common ground they share outweighs the differences. The Linux OS behaves similarly to Unix. Hence it is described as being a “Unix-like” operating system. However, Linux does not have any direct connection to Unix. On the other hand, BSD started out as a closed source OS, but its derivatives are the direct descendants of Unix. Both Linux and BSD operating systems are a collection of open source projects managed by different project maintainers. The major distinguishing trait between Linux and BSD is who controls the kernels. No one person controls the BSD kernels. Linus Torvalds created the Linux kernel. What happens within the Linux kernel development is strictly under Torvalds’ singular control. Linux developers use the Linux kernel to create a Linux distribution after stacking other components. The Linux kernel combined with GNU software and other components produces a Linux operating system. BSD developers create a complete operating system. BSD package management has issues as well. Linux has more choices with its delivery system of precompiled binary packages. You can install software using package managers like APT, yum, pacman, etc. Not so with BSD. For instance, FreeBSD relies on ports to install applications on the operating system. The FreeBSD Ports Collection includes more than 25,000 ports. The ports contain the source code users must compile on the machine. This makes FreeBSD a bit of a challenge for unfamiliar users. However, there is some movement toward a more convenient method of installing BSD software using precompiled binary packages. Another significant difference between Linux and BSD is how licenses regulate their distributions. Linux is distributed under the GNU General Public License (GPL). The GPL is designed to eliminate closed source software. It requires any derivative work to be supplied with source code if requested. By contrast, the BSD license is less restrictive in that binary-only distributions are allowed. The BSD License does not make it compulsory for developers to disclose the source code. It is up to the creators whether they want to make the code open source or not. This makes BSD attractive for embedded applications. That is a loaded question — so I’ll offer a loaded answer. It depends on your needs and your technical skills. My first impressions from dabbling with BSD are twofold. One, it looks more grown-up than it behaves. BSD resembles the scattered performance of some infant Linux distros. Two, Linux operating systems are more reliable out of the box. Linux communities have developed better support from hardware vendors over the years. I see BSD today in much the same place as Linux was in a decade ago. BSD replicates the look and feel of various Linux OSes with familiar desktop environments. Linux is easier to use, especially for less technically savvy users. Let’s take a look at GhostBSD running the MATE desktop. Its live session ISO runs DVD and USB drive. The live session format makes it easier to try out than other BSD offerings. I found the live session experience to be a bit clunkier than a full hard drive installation, however. Ghost BSD’s MATE design lets you run by default two panels and an optional docking bar. GhostBSD is an operating system developed by French Canadian Eric Turgeon. He created this BSD distro to create a GNOME-style distro of FreeBSD. Its target use is to perform casual tasks. Its focus is mainly on helping Linux and Windows users get familiar with BSD. The distro’s name is formed by heavily borrowing from that design goal. It stands for (G)nome (host)ed on Free(BSD). The original pronunciation emphasized a three-syllable sound pattern as in ‘G’ ‘host’ ‘BSD’, according to comments Turgeon posted as part of an online Question and Answer session. Anyone familiar with earlier GNOME desktop designs or the MATE desktop itself will feel right at home with GhostBSD. The only snags will come from the system usage procedures regarding software management. The desktop design sports two panels plus an optional docking bar, or Plank. The background images include a stunning collection of nature photos. GhostBSD does not skimp on providing an attraction collection of background images. The top panel bar holds launch buttons for the applications menu, Places and System tools on the left end. The far-right end holds the usual notifications display area for network connections, battery status, speaker controls and date. The bottom panel holds the Show Desktop button in the far left corner. The far-right edge of the panel is preconfigured with the workspace switcher applet. It comes set with four workspaces. You can adjust the settings easily by right-clicking on the applet and selecting the Preferences option. The large middle sections of both upper and lower panel bars are empty. You can right-click on the panel to adjust its properties or add a new panel or panel applets. The Plank sits on the bottom center of the screen. It is optional, but it is worth using as a special docking bar and Quick Launcher for frequently used applications. You also can use it in place of the bottom panel. Either way, running applications appear as small silhouettes on the bottom panel. They also display their icons on the Plank if it is activated. A small dot appears under the icon docked on the Plank. You can place launch icons on the bottom panel bar or add them to the Favorites column in the main menu. Just right-click on an application’s name in the menu list and select the locations where you want to add or remove them. You also can add application launch icons on the desktop. Overall, navigating your way around the MATE desktop could not be easier. The Control Panel and other system tools make it equally easy to adjust the settings so GhostBSD will play your way. The applications themselves in GhostBSD do not differ much, if at all, from their counterparts when running on Linux. This makes it easy to transition from Linux to at least this flavor of BSD. Of course, someone coming directly from the Windows, OS X or macOS systems will have to get acquainted with the change in nomenclature and the way the applications perform. Even if a new BSD user is familiar with Linux applications of other Linux distros, not all of the included programs will be familiar. In the case of adopting GhostBD, its use of the MATE desktop brings with it a proclivity for quite a few MATE-specific applications. That same situation no doubt exists with the use of KDE-flavored applications. Some distros in both Linux and BSD include applications keenly designed with that family in mind. That can be a bit more of an issue with the BSD family of operating systems. BSD has considerably fewer applications than the computing world of Linux. BSD developers have tried to create a Linux compatibility package to run Linux applications on BSD. So far, that is a work in progress. 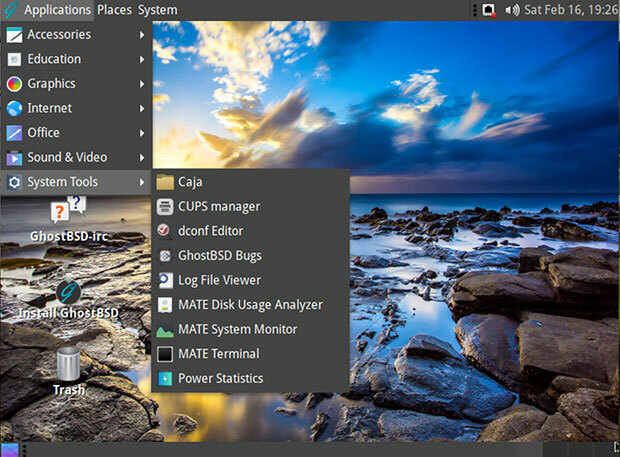 Some of the applications bundled with GhostBSD include standards such as the Pluma text editor, Eye of MATE Image Viewer and the Caja file manager. Other general usage applications that come with GhostBSD include Cheese Web Cam, GNOME MPlayer, Xburn CD/DVD creator, Exaile music player, and the Shotwell photo manager. Other Linux standards included in GhostBSD are the Firefox Web browser, Pidgin Internet Messenger, Thunderbird email client and the Transmission Bittorrent download tool. You also get the CUPS printer manager and an almost current version of the LibreOffice suite. I suspect that part of the answer to the USB drive problem rests with BSD not being fully Plug N Play compatible. That is what makes GhostBSD an ideal operating system to dig into and make it more user acceptable. Check back in upcoming weeks for more insight into running other Linux-like BSD distributions from the realms of FreeBSD, OpenBSD, NetBSD, DragonFly BSD and other distributions. One last thing: You no doubt know that Tux is the Penguin mascot for Linux. BSD has its own mascot. It is the BSD Daemon or Beastie, a cute-looking demon cartoon creature.